This is an authentic Hungarian goulash recipe. It is really a delicious variation of beef stew – with a bit of a twist. Melt the butter or margarine in a large saucepan over low heat. Add the onion, tomato and green pepper. Sauté a few minutes, until onions are soft. Add the beef, beef stock, flour, paprika and red wine. Simmer, covered, for 30 minutes. Add the water, cover and simmer for 90 minutes. When the goulash is almost ready, cook the egg noodles in a large pan of boiling water. Drain well. Serve the goulash on a bed of noodles, topped with a dollop of sour cream. Some recipes call for poppy seeds. They are a nice addition. If you use them, add 3 tablespoons of poppy seeds when you add the wine and beef stock. The ingredient that makes this a truly authentic dish is the addition of Hungarian sweet paprika, which gives it it’s distinctive flavor. If you do not have access to Hungarian paprika, don’t worry, just use regular paprika. It will be fine. This is a wonderful comfort food recipe. I would serve it with green beans and a crisp salad. This recipe works well as a diabetes diet recipe. It is fairly low in carbohydrates. Just add lots of vegetables to your meal. If you like this recipe, I’d love you to Pin it to Pinterest, Tweet about it and Like it on Facebook. You can also leave a comment and your own recipes below. 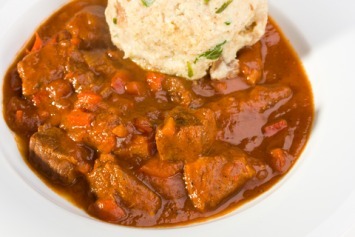 This tummy warming goulash recipe is just one of our tasty beef recipes. Find them all here. instead of beef I used sausage and cabbage, every thing else the same as recipe called for … and slow cooked in slower cooker found hungarian paprika at Walmart… Go figure… Awsome flavor while cooking even better when it was time to eat will do this one again for sure. 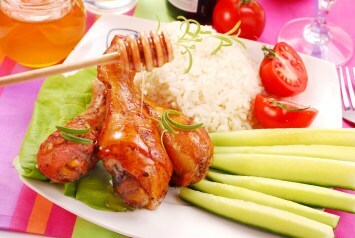 This is an excellent recipe that i have been using for the past 3 years. I give it a 5 for taste. Although I follow this recipe, I usually leave out the sour cream, and replace the egg noodles with hand made dumplings. In addition, I add about 1-1.5 teaspoons of cayenne pepper to spice it up even more.